Camping Pomport Beach is a fairly small but exceedingly well maintained campsite which lies in the heart of the countryside a short distance from the town of Bergerac. Occupying 12 hectares of pleasantly landscaped grounds, Camping Pomport Beach enjoys a really picturesque rural setting in the centre of a woodland and rolling farmland. Camping Pomport Beach is an extremely family friendly campsite offering a whole range of activities on site, whilst also being in the perfect location from which you can explore the surrounding area. The stunning town of Bergerac can be reached in a little over 10 minutes and is well renowned for its history, art, culture and of course wine. You’ll also find a great range of different shops and facilities there ensuring you’ll have everything you’ll need whilst on holiday. Swimming facilities at the campsite are truly excellent. Although you’ll be miles away from the coast when staying at Camping Pomport Beach you’ll even have your own beach. The on site lake has it’s own beach which is a welcome addition to the facilities and you can also fish, swim and use canoes and pedalos on the lake. In addition to the lake families will also love the swimming pool. 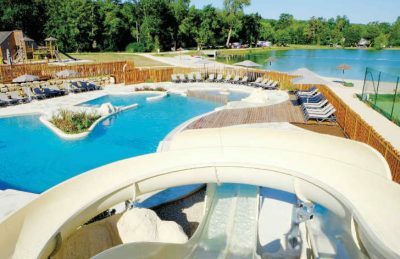 Boasting a wonderful sunny lagoon pool with a children’s pool and several slides, the whole family are sure to have a lot of fun. Although Camping Pomport Beach campsite isn’t the largest of campsites there are still a fantastic range of activities and facilities on site. On site activities at Camping Pomport Beach campsite include table tennis, tennis, football, badminton, basketball, volleyball, boules, mini golf, fishing, canoeing, pedalos and a playground. Facilities available at Camping Pomport Beach campsite include WIFI, takeaway, bar, animation team, games room, washers and dryers. Accommodation at Camping Pomport Beach campsite includes a range of safari tents and mobile homes that are available from Eurocamp.